“The Big Five” animals of South Africa are the elephant, leopard, rhinoceros, buffalo and lion. 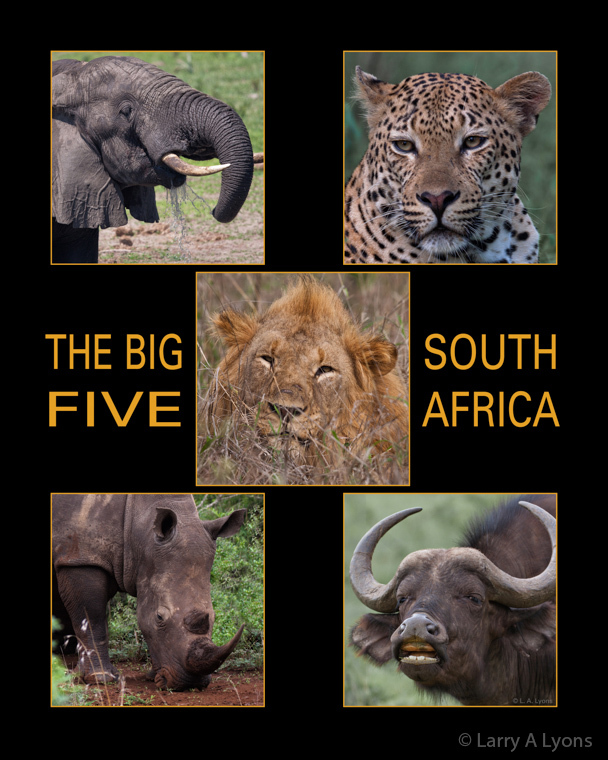 The term “Big Five” game was a term derived by hunters designating the most difficult and dangerous animals to hunt. The impressive conservation practices and extensive national and private reserves in South Africa has significantly aided in protecting the survival of these animals. However, poaching of rhinos and elephants for their horns and tusks continues to be a significant problem for the survival of these species. All of these images were captured in South Africa at the Thanda Game Reserve or nearby reserves while volunteering for six weeks with the African Impact Organization (www.africanimpact.com) in September through October 2012. This family portrait of a baby, young teenager and two adult female elephants was photographed from a boat when a herd of 50 or more elephants gathered at the lake for a drink and bath. 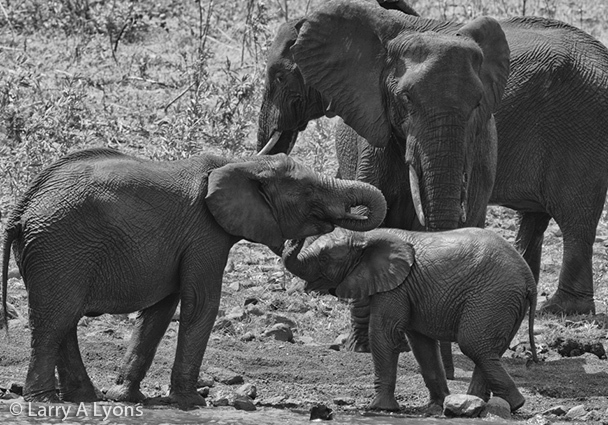 Herds of elephants are made-up of related females and their young. 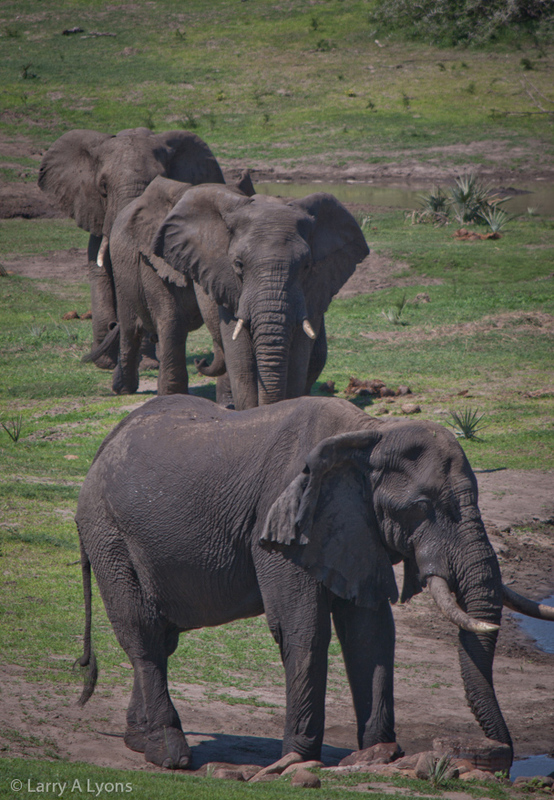 Male elephants usually leave the herd when reaching adolescence forming bachelor herds. Later, the adult male elephants lead a solitary life. Calves are the primary focus of the family unit and are cared for by their mothers during at least their first three years. 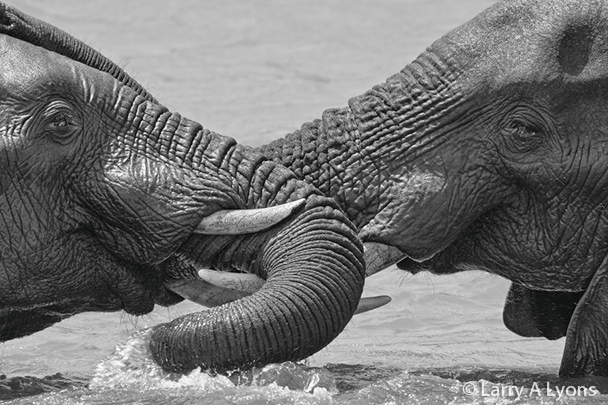 These dueling male elephants were photographed from a boat with a long lens. Male African bush elephants weigh up to 12,000 pounds and have periods of extreme aggression not only between each other, but anything that comes across its path. 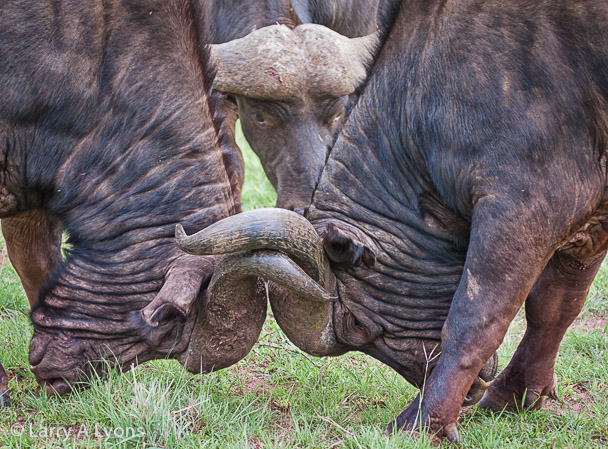 Here the two bulls are fighting for dominance. 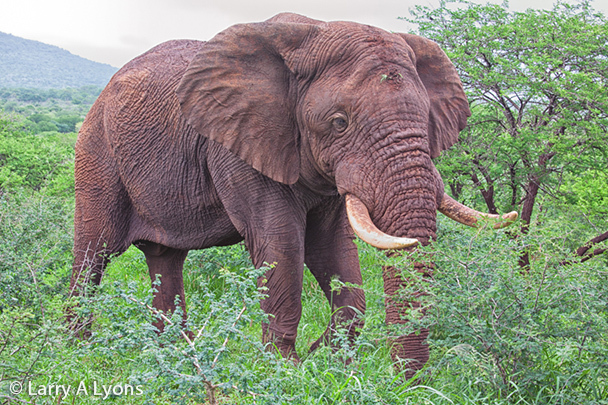 Besides fighting, tusks are also used for marking, feeding, and digging. Poaching of the tusks for the ivory trade is one of the greatest threats to the elephant populations. 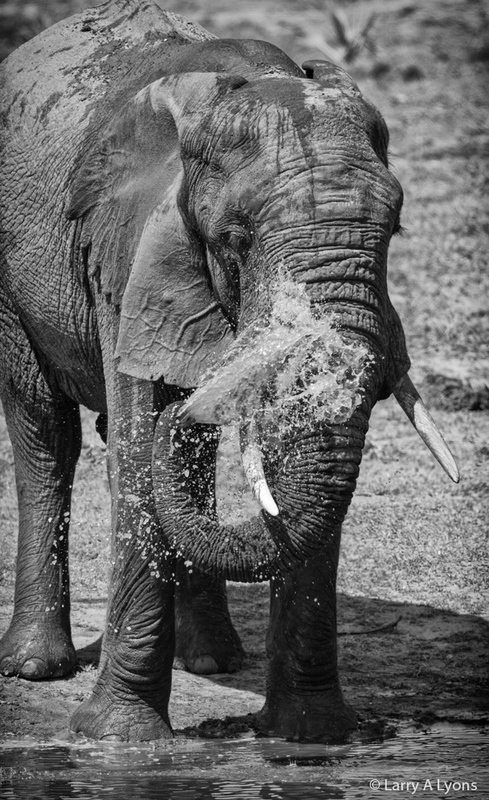 The elephant’s trunk has many functions including breathing, feeding, smelling, touching, grasping, producing sound, drinking and bathing. Elephants are herbivores and will consume leaves, fruit, twigs, bark and roots. They also will consume up to 11 gallons (40 liters) of water each day. Elephants prefer to stay near water. Elephants can live up to 70 years in the wild. 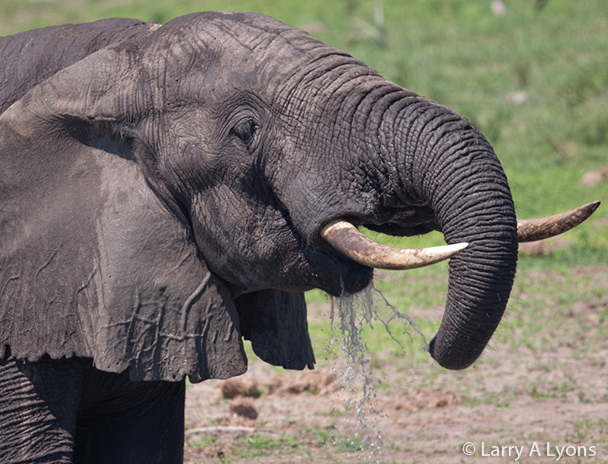 This bull elephant has a crust of bark on its forehead probably from recently mowing down a tree for consumption. The leopard is the most secretive and elusive of the large carnivore cats. They are basically solitary and go out of their way to avoid one another. 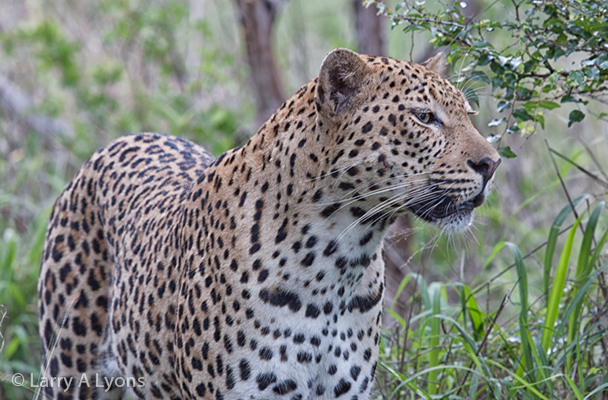 Leopards are primarily nocturnal and their spotted coat provides almost perfect camouflage. They move about their home ranges and seldom stay in an area for more than two or three days. Subsequently, leopard sightings tend to be rare. 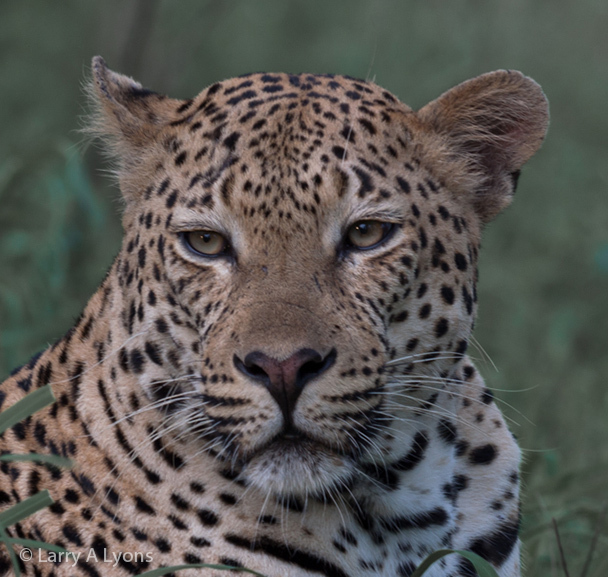 While at the Thanda reserve, the opportunity to see a leopard on three different occasions was most fortunate. Leopards are opportunistic hunters that will consume a wide variety of animals including antelopes, monkeys, foxes, jackals, rodents, amphibians, and birds. 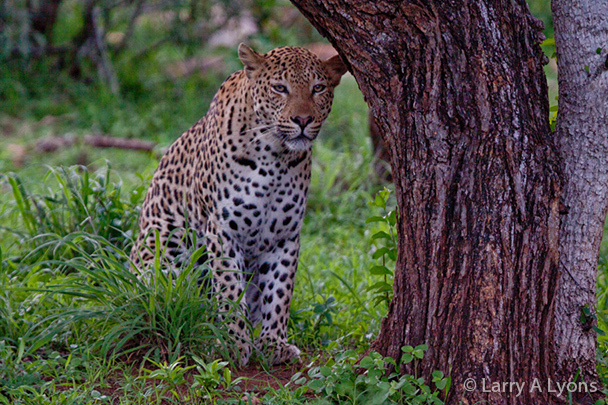 The leopard’s stealth, rapid speed, and strength to drag their prey up into a tree provide a forbidding predator. Leopard is a stunning beautiful animal. Lions are the only cats that live in groups called prides. 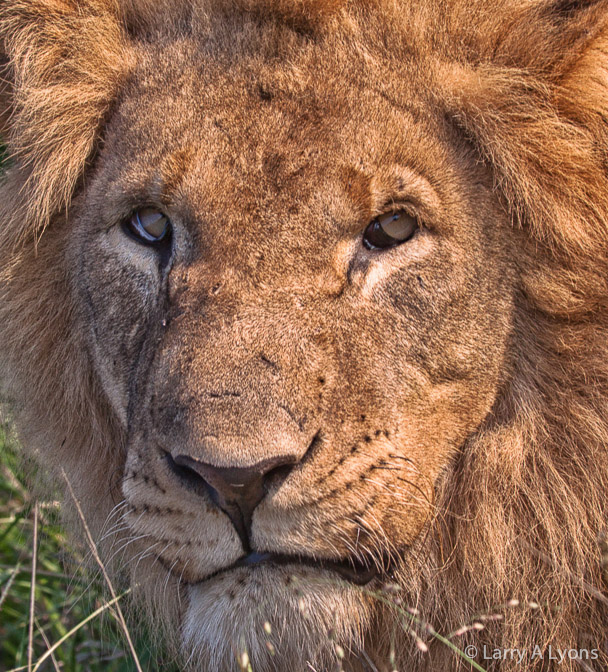 Lions once roamed most of Africa, but today they are only found in parts of sub-Saharan Africa. 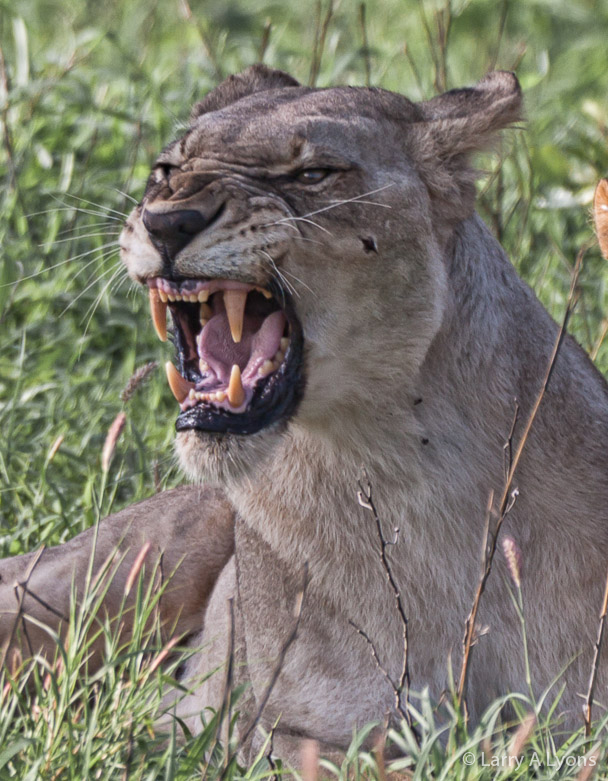 Two prides co-exist at the Thanda Reserve. 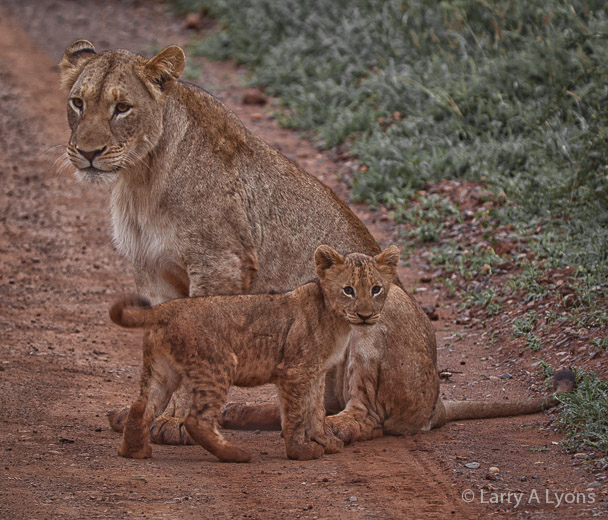 It is the through the conservation efforts of South Africa and private reserves like Thanda that make it possible for lion prides to roam free. 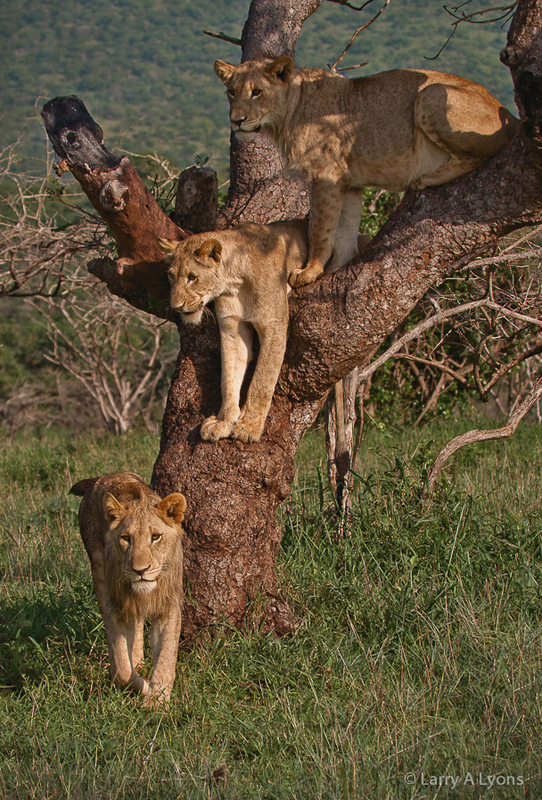 This young adult male with its mane still growing in and the two females perched in the tree belong to the North pride. 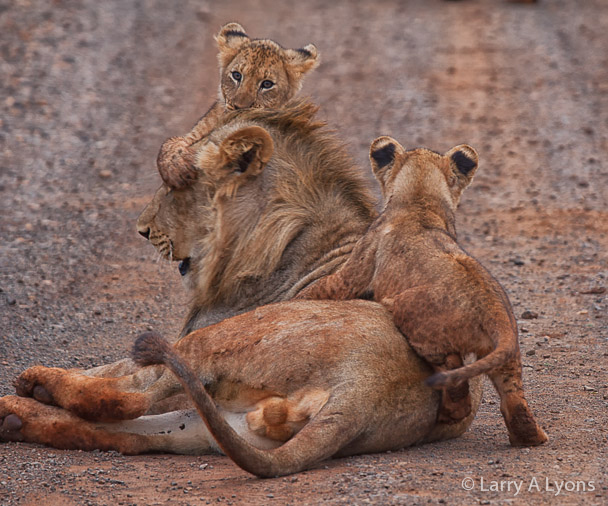 Male lions defend the pride’s territory while females are the pride’s primary hunters. 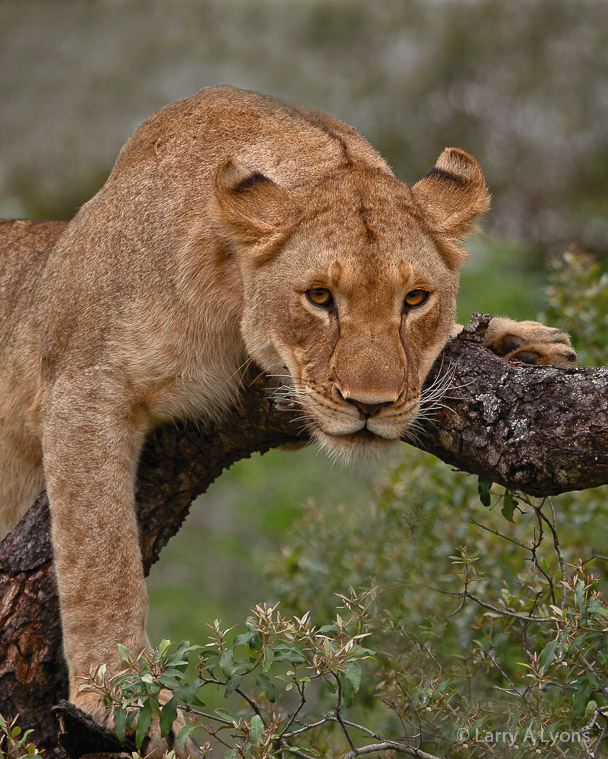 This female lioness is staking some high ground to keep vigilance over the savanna. 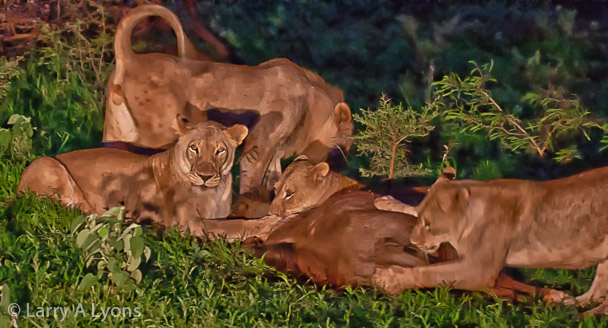 Female lions, being the pride’s primary hunters, often work together to prey upon wildebeest, antelopes, zebra and other large animals of the open grasslands. Many of these animals are faster than lions, so teamwork pays off. The roaring sound of these lions when mating was quite intense. The rolling eyes and their display of teeth further imply that nothing interrupts this activity. 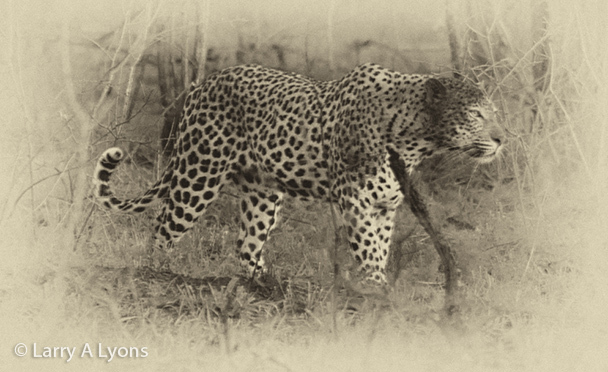 This image was captured from a safari jeep at a distance of 20 feet. These cubs were about one month old. 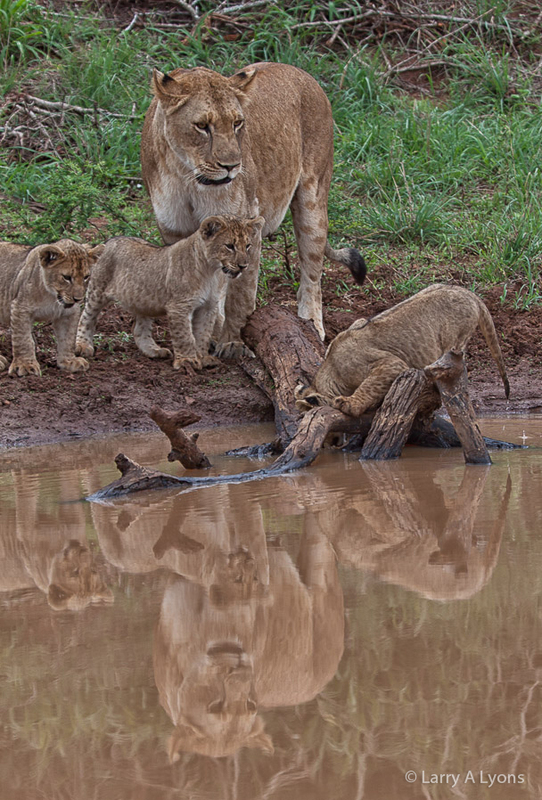 Lions within a pride are quite affectionate and attentive between themselves and their cubs. Hunting is often a nocturnal event. Here a team of female lions stalked and ambushed this wildebeest. Everything is recycled on the African savanna. 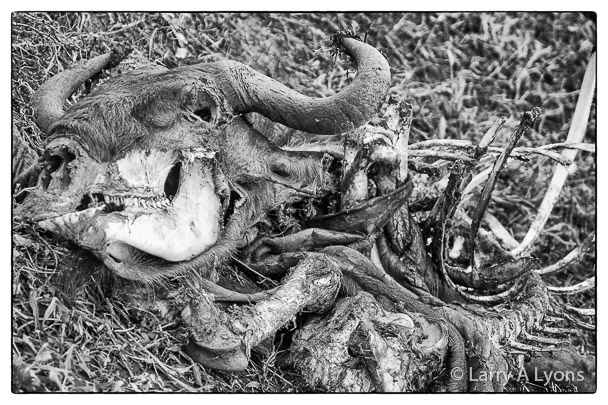 Here are the remains of that wildebeest. Lion populations have been reduced to 21,000 in all of Africa and are now only found in parts of the south Sahara desert and parts of eastern and southern Africa. 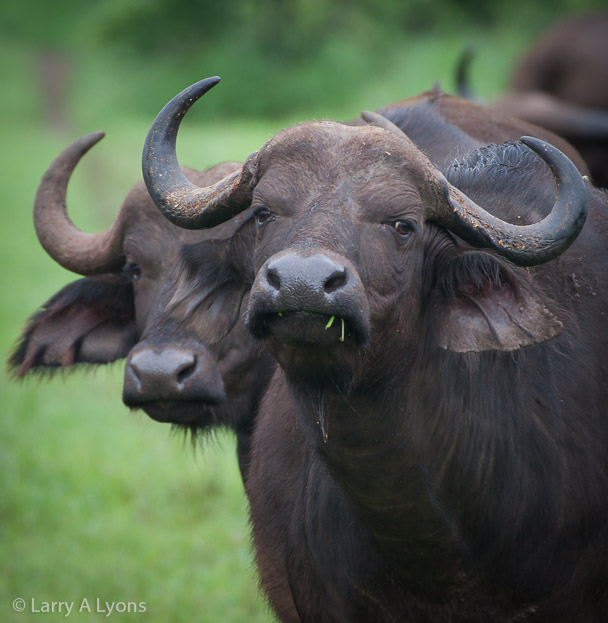 Reserves, like the Thanda Game Reserve, are crucial for their survival. 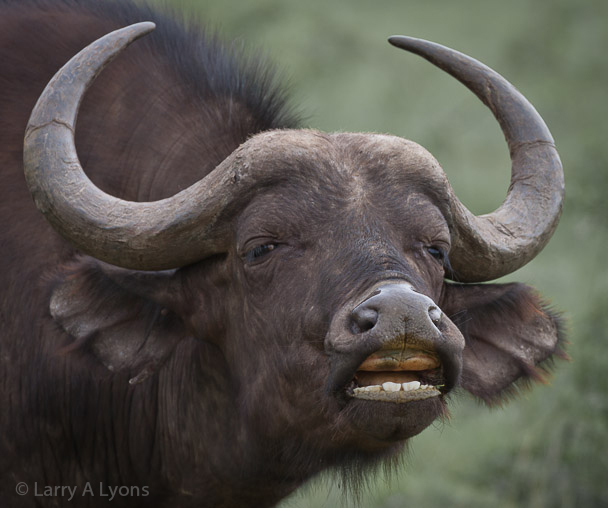 Don’t let this smile fool you, the African buffalo is known for its unpredictable behavior. It is regarded as a very dangerous animal and is supposedly responsible for killing 200 people per year. 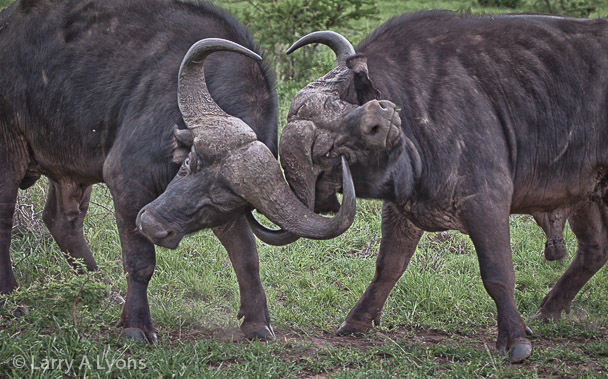 Adult bulls can be observed sparing quite regularly. Most sparing seems to be harmless and short-lived. Yes, Buffalos do it too! Mating occurs between March and May. Single Calves are born between January and April. They are gregarious with herds varying in size of up to several hundred. Buffalos are herbivores. These female beauties are distinguished by their smaller horns. 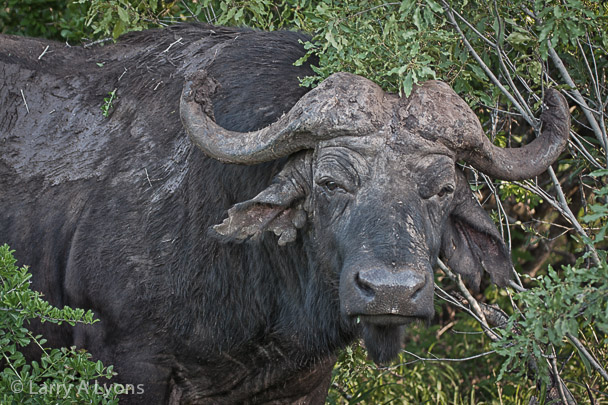 This older looking bull posing here had just come from a mud bath. Its particular thick horns would indicate that it is a dominant bull within the herd. 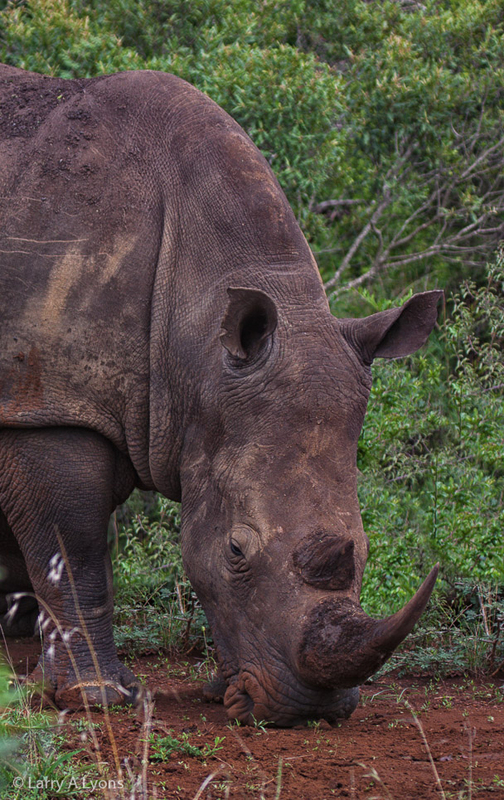 The African Rhinos, both the Black Rhino and the White Rhino, are facing extinction. This White Rhinoceros, which is actually grey in color, has a square muzzle that is adapted for grazing on grasses. This Black Rhino, photographed during a night safari drive, has more of a beak shaped lip that is used for browsing leaves, buds and shoots of bushes and trees. 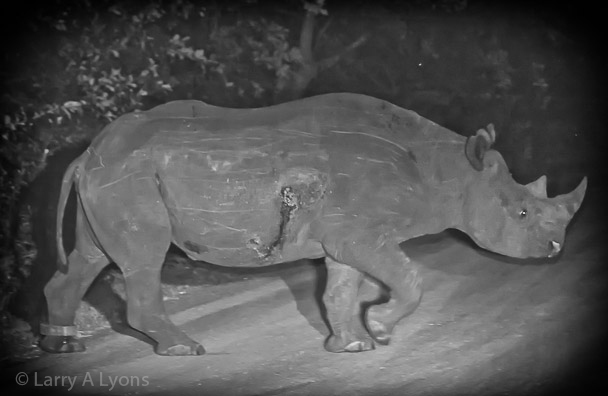 The cause of the injury to this rhino is unknown, bit it appears that it may have been gored by one of its own. 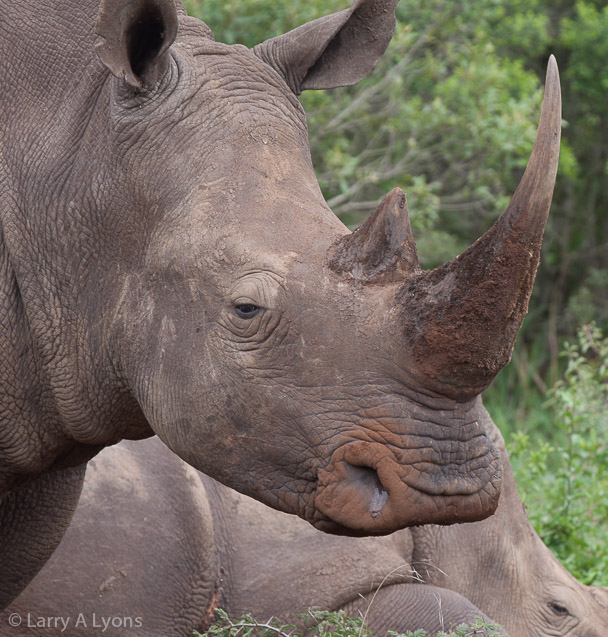 Both White and Black Rhinos are at risk of extinction because of poaching of their horns. There is a fallacy that the horns have some medicinal value, even for curing cancer (in Asia), and as a result there is market that provides a premium price for the horns. 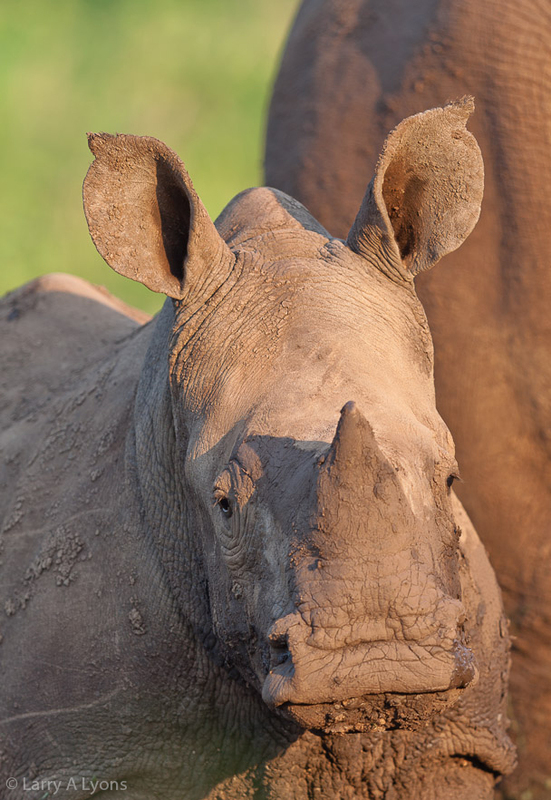 However, Rhino horns are simply made of keratin, the same material as our fingernails. Poachers brutally kill the rhinos and remove the horns. 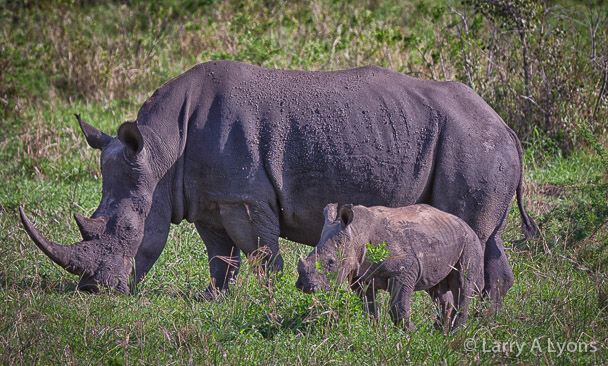 An averaged sized rhino horn can bring a quarter of million dollars in Vietnam. Rhinos are also in trouble because of the lack of habitat from agriculture and deforestation. 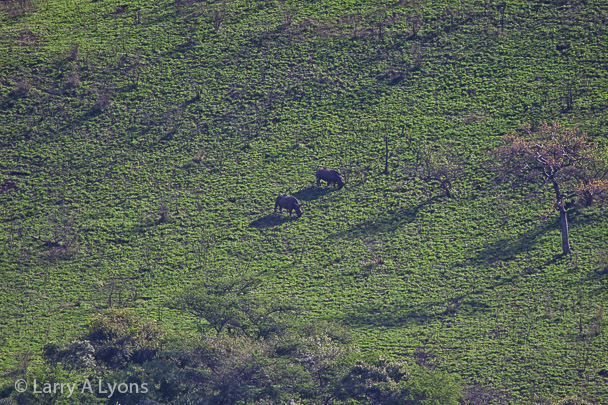 The importance of game reserves, like Thanda, is crucial for their survival. The female gestation period lasts 15 to 16 months and usually only one calf is born. Baby rhinos begin to grow their horn when they are only a few weeks old. During the first year the calf only feeds on the milk from the mother. A calf remains near its mother for the first four to five years for protection. Rhinos have no natural predators, except for man. 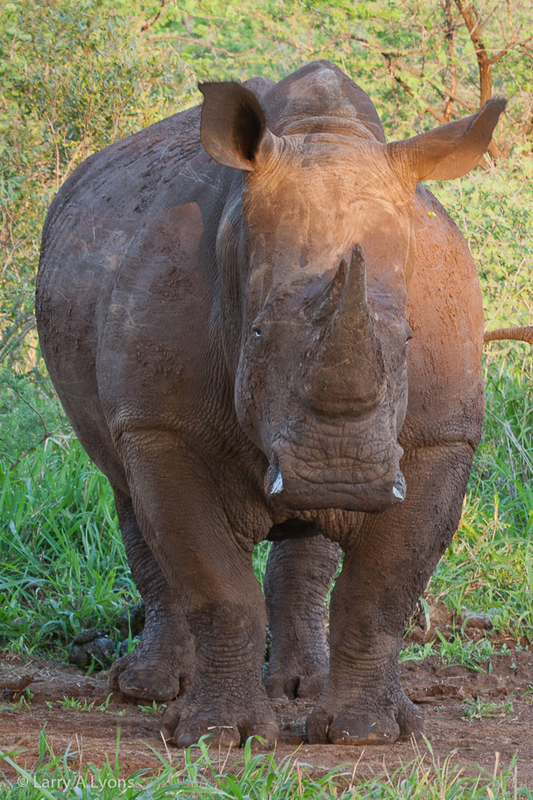 Rhinos are considered critically endangered. There are several organizations, including the African Wildlife Foundation, that have programs working to “Save the Rhino”. Incredible! I learned so much from your blog and I was with you on the trip! WOW! I just got a great lesson on the ‘Big Five’. Great information and photos and best wishes for many happy days blogging! Just INCREDIBLE!!!!!! 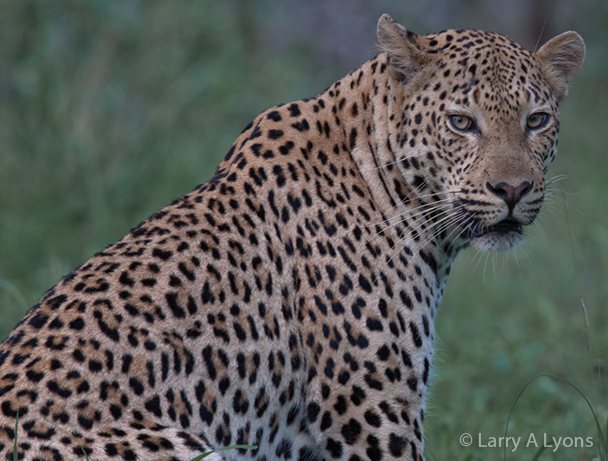 Fantastic work Larry, not only amazing photography but really great information to accompany it too. Great images! I am going to Thanda in Sept/Oct 2013 to do the photo/conservation tour. 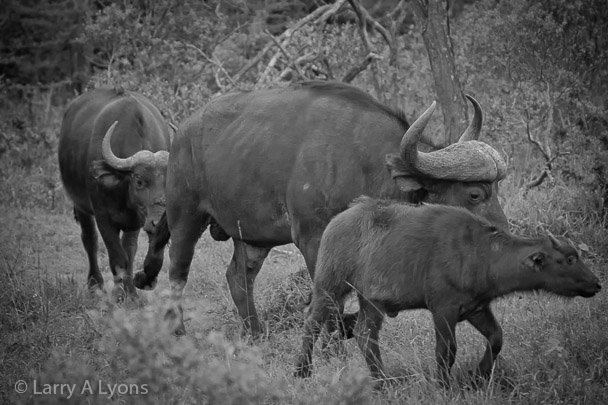 I am a veterinarian and have been a wildlife photography enthusiast for over 40 yrs. Your photos have made me that much more anxious and excited to go. It was wonderful seeing these images at the gallery but now I can see them over and over again. Beautiful work. Great start to your blog, Larry. What wonderful memories you must have of such an incredible trip. Looking forward to your next entry.